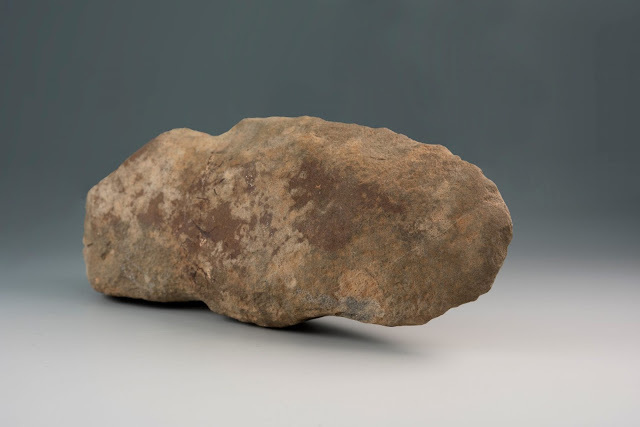 On October 12, 2018, a group of students and teachers participating in an archaeology field trip to Mount Vernon helped to discover a stone axe head dating back to the fourth millennia BCE. The axe is roughly seven inches long and three inches wide. Similar axes date to the Archaic Period of Virginia’s history (4,500-8,000 years ago) and would have been an important part of the Native American toolkit roughly 6,000 years ago. The group made this archaeological discovery at Mount Vernon’s African American cemetery, which oral history suggests was the resting place for enslaved individuals and possibly some of their freed descendants. The discovery took place along the ridgeline upon which the African American cemetery sits, which was used by communities of Virginia Indians as long ago as 8,000 years ago, and continuing for several thousand years afterwards based upon the archaeological evidence. While the site appears to have been continually occupied over this period, it was not necessarily a “village” site. Rather, the location was probably one of many temporary stopping over points for a community as they traveled along the river or exploited the resources of the area. For Mount Vernon’s archaeologists, artifacts such as this axe help us interpret the daily lives of people in the past. Its archaeology program maintains an electronic database where data is recorded about every artifact recovered and where it was found. After cataloging objects, Mount Vernon’s team cleans, preserves, and stores all of our artifacts here on-site so they are available for researchers. The axe will join Mount Vernon’s rich archaeology collection of more than 50,000 artifacts cataloged from this site alone as the staff continue to learn more about and document the long history of human occupation at Mount Vernon. For more information about Mount Vernon’s archaeology program, please visit http://www.mountvernon.org/archaeology.